Shout out to my boy Jamie Olive for providing the inspiration of today’s Lemony Feta & Sweet Potato Mash. Once again – he does not disappoint. A few weeks ago Mike & I went on a little bit of a Jamie Oliver binge watching through his 30 minute meal series. There’s something incredibly satisfying about watching someone throw together a 3 course meal in a bright, clean kitchen without caring about the fact that they are in fact dirtying up about 5,000 dishes and appliances….I could certainly do with a paid kitchen staff to clean my kitchen for me at the end of the day – what do you think? But I digress…onto the mash! 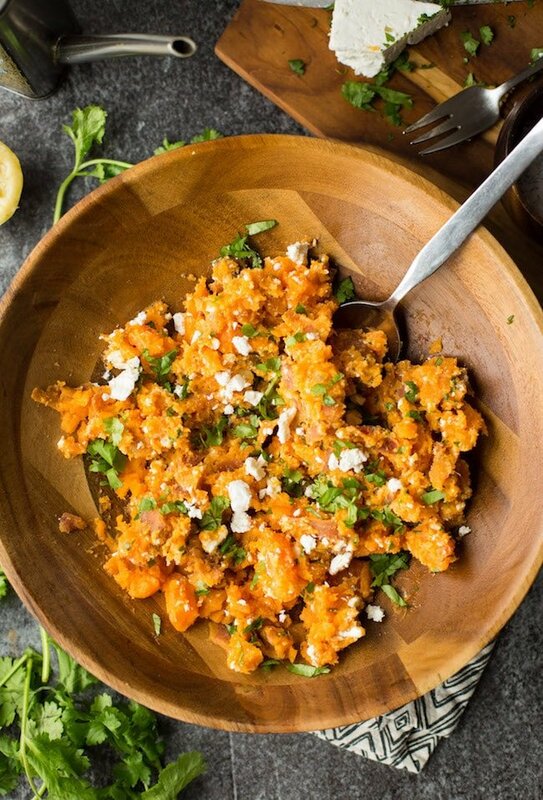 While this sweet potato mash take about 20 minutes to make from start to finish it really only needs about 5 minutes of hands on time. 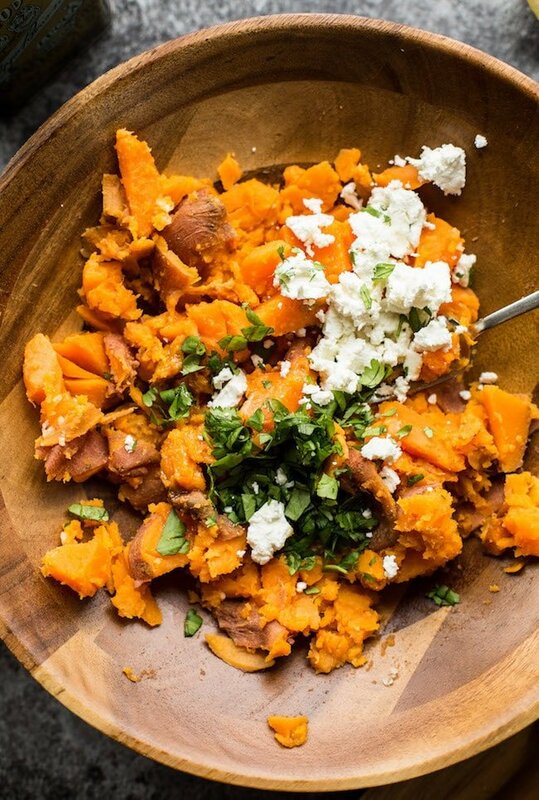 Start out by roughly chopping up your sweet potato – no need to peel or chop pretty. Add the cut up spuds to a large cooking pot, add half a lemon and cover with water. Boil for about 15 minutes. When the potatoes are fork tender you’re ready to go. After your remove the potatoes from the heat, drain and place in a large bowl or serving tray. At this point all you need to do is pile on your remaining ingredients and mash it all together until combined. Taste, season with a little salt or an extra squeeze of lemon if needed and that’s it. While the original recipe didn’t call for any garlic, I thought it went well here. If you’re looking for a low FODMAP option you can leave it out altogether or add a glug of garlic infused olive oil. You can make your own at home pretty easily, or you can always save yourself the work and buy a bottle. If you do buy a bottle – make sure there are no garlic bits floating around so that it’s FODMAP friendly. This dish is fast, fresh, and incredibly delicious. It’s easy enough to make a quick, weekday side or maybe even your upcoming holiday table. This would pair well most chicken dishes like this White Wine Braised Chicken & Veggies or these Balsamic Glazed Chicken Legs. 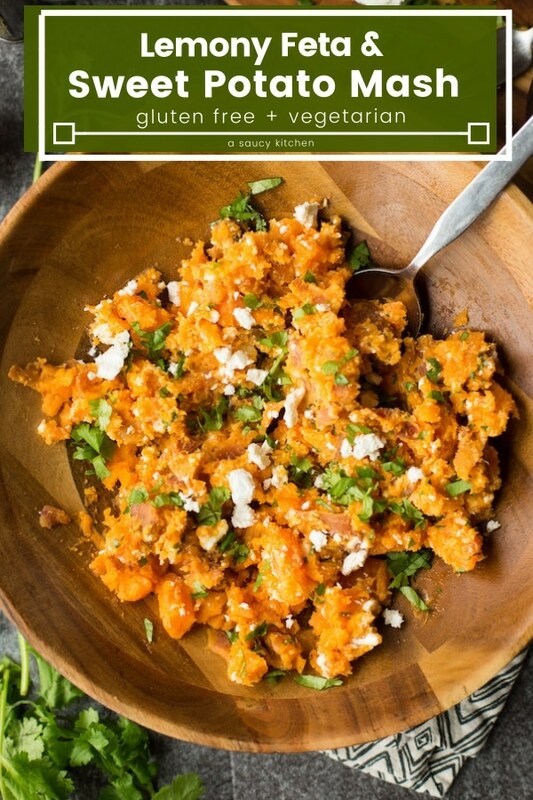 Don’t forget to tag @asaucykitchen if you try this Sweet Potato Mash! You can also post your pictures to my facebook page! Add the cut up sweet potatoes and 1/2 lemon to a large sauce pan and cover with water. Add the salt. Turn the heat up to high and bring to a boil. Once boiling reduce the heat down to a medium low and let simmer for about 15 minutes of until the potatoes are fork tender. Drain out the water. Transfer the potatoes to a large bowl and roughly mash with a fork. Add the garlic (or infused olive oil), cilantro, feta and pepper and continue mashing and mixing until combined. Taste and season with a little salt if needed and serve. 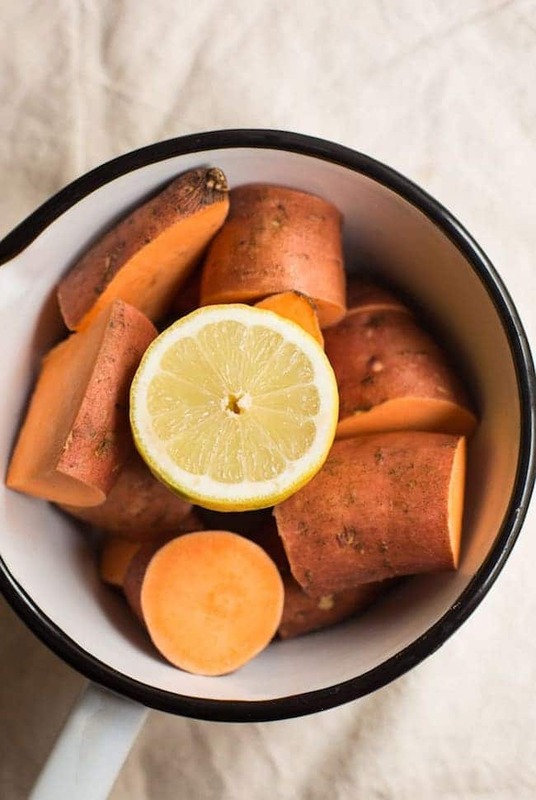 Sweet potato is considered safe for Low FODMAP at 1/2 cup so make sure to measure the amount you serve yourself or others if making this FODMAP friendly.